Woke up shattered after too much sleep. As usual I was ready way too early for breakfast so I spent some time writing my journal and contemplating the highs and lows of the previous 12 days. For the first time I felt the end of the walk was the next big event and that left me feeling a bit down. Of course I couldn’t wait to see my family again but in all honesty, that was all I’d missed. I had fallen very easily into the routine and lifestyle of the long distance walker and I felt the beginning of a slow rising panic that it would soon be all over. No more days spent braving the elements. No more lung busting climbing or knee trembling descents. No more being surrounded by openness and wilderness. No more that feeling of freedom and being in control of my short-term destiny. Most importantly no more being able to chat, or not, about everything and nothing. 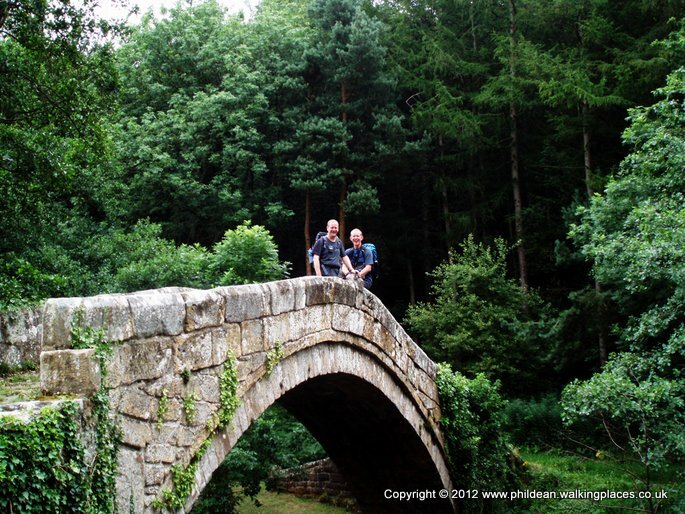 After yesterday’s foot-numbing hike todays task was somewhat easier – 8 miles to the tiny hamlet of Littlebeck. Although the distance seemed ridiculously short there was a lot to take in on this section so we decided to take it really easy and stop as many times as possible to enjoy the moment. That still didn’t stop us being down for breakfast at the earliest time. Surprisingly, two other walkers who we had met a few times were already in the conservatory helping themselves to the ‘first course’. These two girls were from North Manchester and had an interesting outlook on walking the Coast to Coast. They had found themselves in all sorts of scrapes getting lost on numberous occassons and using buses and taxis to get themselves back on track. They viewed it as a holiday and if they decided on a certain day that it was getting too hard or too sweaty they opted out and got a ride. I actually found this quite refreshing to meet someone who didn’t take themselves too seriously. They had had a real laugh all the way through and got to know an awful lot of people. They told us some rum stories as we ate ‘second course’ then said their farewells and went. Nige and I tried to play it cool by ordering a third pot of tea but this was one too many for both of us and we left it half full and scuttled off to get our gear and pay our bill. Just outside we bumped into the young Dutch couple who took our photo on the beggars bridge. We crossed the stream and entered East Arncliffe woods which were very quiet and picturesque. Before long we met a road and wound our way as slowly as possible into the village of Egton Bridge. 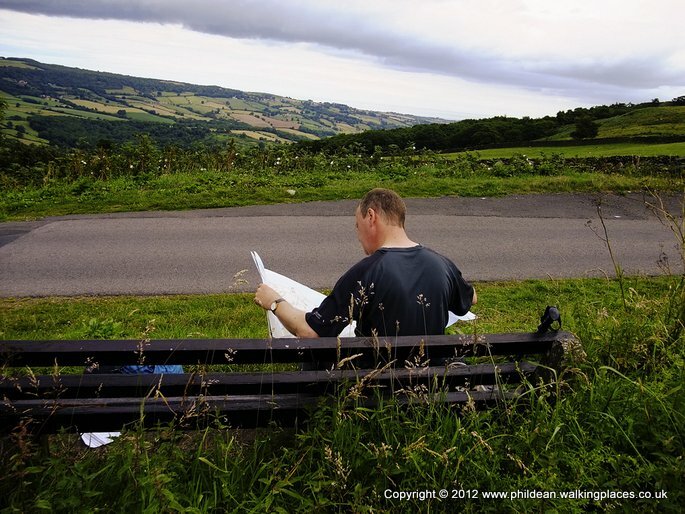 We turned right at Egton Manor and followed the estate road the 1.5 miles into Grosmont. 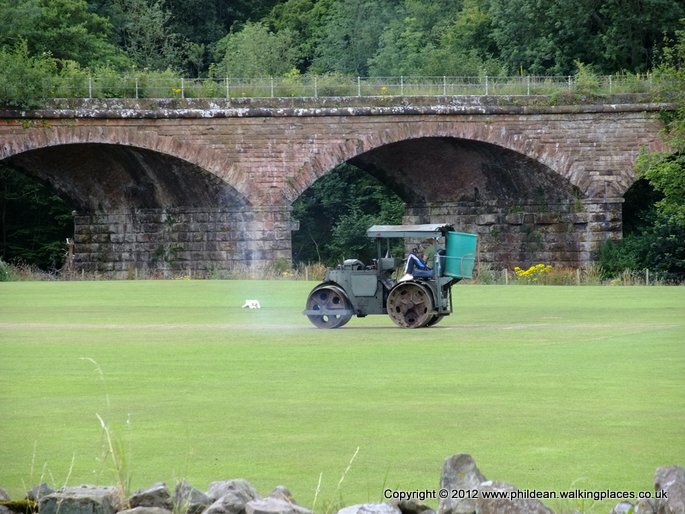 It was really peaceful walking into the village and the only traffic we saw was the groundsman (on his mobile phone) rolling the cricket pitch. Once we hit the first buildings it was clear that this was a popular tourist spot. We had read-up about the steam trains etc but weren’t prepared for the number of people milling around the few souvenir shops. 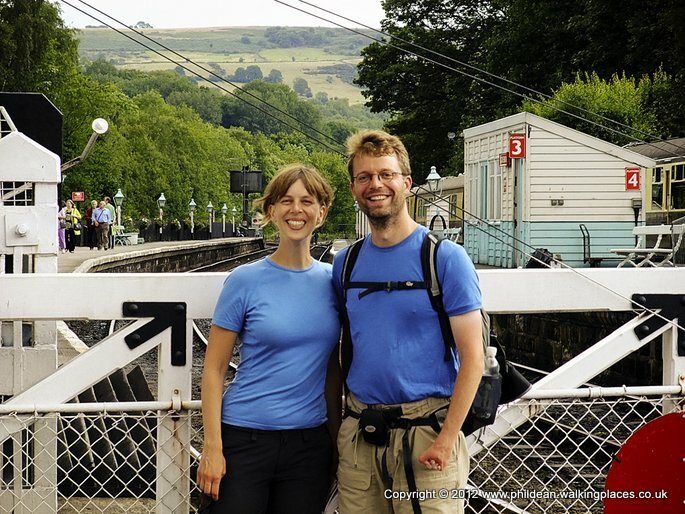 We fought our way to the level crossing and bumped into the couple who had taken our photo on the bridge and decided to reciprocate. There was no question that we weren’t going to stop for a cream tea. Not because we were hungry, far from it, but it was still only 10:30am and we only had about 6 miles to go. We had to slow down somehow so I bought the works and we grabbed the one free table on the platform. Unfortunately, there did seem to be a reason that one table was free and before long Nige was completely cheesed-off swatting at what seemed like hundreds of wasps all intent in sharing our strawberry jam. 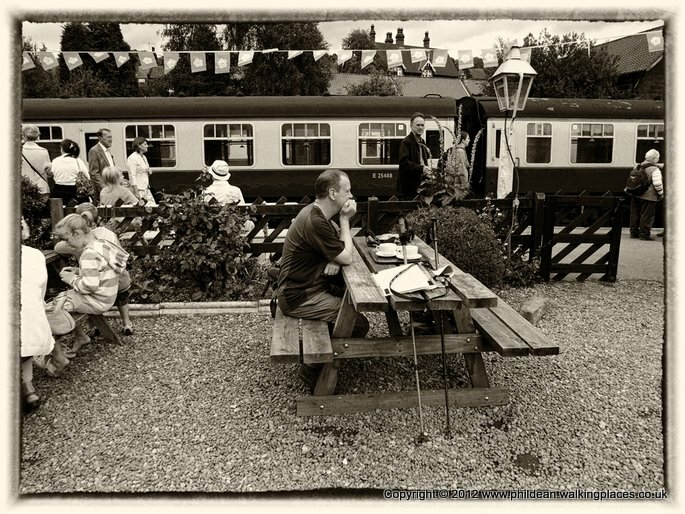 To be fair, we did watch 2 steam trains come in to the station and it was kind of magic. Nige then went into one of his rants about how Beeching had ruined everything etc and whilst nodding and being in full agreement I felt that was the proper time to move on and shuffle the next couple of miles as slowly as possible. Luckily we were aided in this by immediately hitting an extremely steep and prolonged road climb up to the top of Sleights Moor. 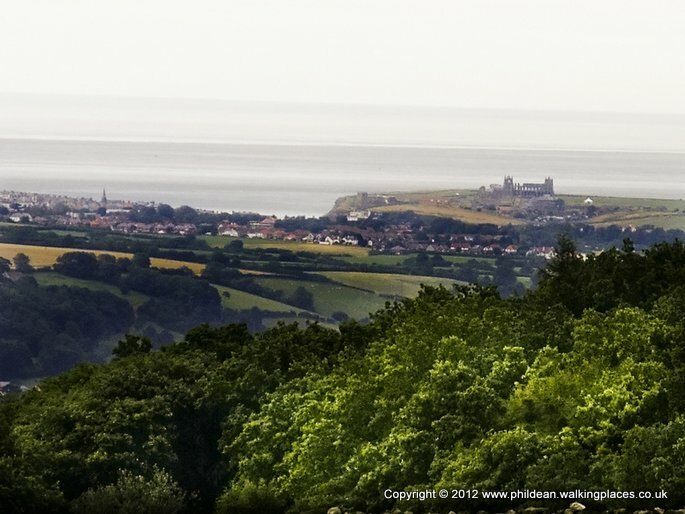 This took us by surprise coming so soon after such an indigestible snack so we stopped at a bench at the top and took in the view over to Whitby Abbey. The rest of the walk to Littlebeck was pleasant enough but pretty uneventful. We crossed the A169 and picked up the path which dropped us down to the village. We knew there would be no phone signal in the village so we made a couple of calls and sent texts before the stroll down to Intake Farm. We had both been looking forward to stopping at this particular Farm because of what we had read about it on other peoples blogs. I will leave my evenings e-mail to describe our experience. This place is legendary and is talked about on all the c2c blogs because of the welcome you get here. 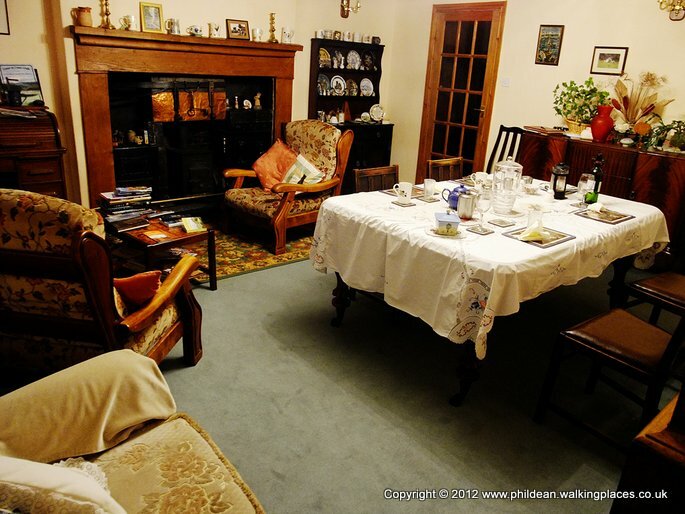 We were met by Judith, who was in the middle of making casserole for our tea later, but still found the time to feed us huge slices of homemade orange cake and mugs of tea. I was starting to feel nauseous now because of all the cake I'd eaten after what can only be described as a monstrous full english breakfast only a few hours earlier ! This is a working farm and I'm typing this whilst looking out at the yard watching hundreds of sheep being herded right under my window to another field. Got to eat here tonight because there is nowhere else for miles but looking forward to a bit of home cooking. One other couple sitting down to eat with us who, if I'm honest, get on my nerves. Managed to avoid getting collared by them so far but unavoidable tonight. Just hope Nige behaves himself ! One more diary if / when I get chance in Robin Hoods Bay at the finish line once I've dipped my feet in the North Sea, dropped the pebble I carried all the way from St Bees and downed many pints with people I've met along the way.